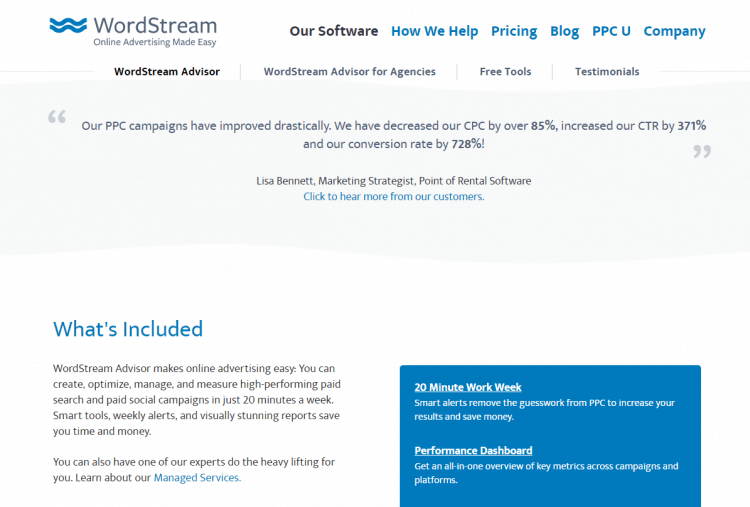 WordStream Advisor is a suite of online marketing and advertising tools helping you get better results. You can create, optimize, manage, and measure high-performing paid search and paid social campaigns in just 20 minutes a week. Smart tools, weekly alerts, and visually stunning reports are accessible within the platform to save you time and money. Easy and effective tools for Facebook Advertising. With WordStream Advisor for Agencies, you can optimize your clients’ paid search and social advertising campaigns in just 20 minutes per week. Smart tools and weekly alerts save time and money, and visually stunning reporting makes it easy to show your clients how much you’re doing for them.